Harley Davidson used the same clutch on all of it's Big Twin models from 1941 to 1984, with only a few changes. These days it is commonly referred to as a 4 speed clutch even though it continued in use on the early 5 speed transmissions. These days it is commonly renounced as being a piece of junk. I am sure that helps to sell more modern clutch conversions, but the clutch itself hardly deserves the assessment. The complaints generally go something like this: "The bike still tries to creep forward even with the clutch lever pulled all the way in." The clutch is grabby." "It's hard to get into first gear." "It's hard to find neutral." A few items are all it generally takes to make the clutch work "as good as new." A few more trick can make it better than new. Here are some common problems and solutions. 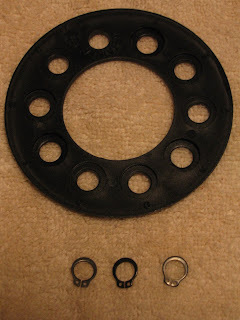 Oil soaked and gummy fiber plates - solution: replace the discs. There have been a lot of "stop gap" measures to avoid replacing the fibers over the years such as baking to draw the oil out, spraying with brake cleaner and such. None of the work particularly well. Buy even the cheapest replacement fibers you can get, and you will be much more satisfied. Primary chain or belt misaligned - solution: align. If your clutch basket is inboard in relation to the engine sprocket, when you pull in the clutch, the basket will naturally move out to align with the engine sprocket. This takes up the free space between the plates that pulling in the clutch was supposed to give, resulting in a dragging clutch. Primary chain or belt too tight - solution: adjust. Very similar to number 3 above. Obviously adjusting a chain is pretty easy. 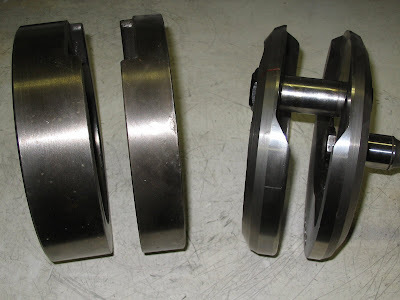 Some belt drives are non adjustable due to rigid primary housings. Consult the manufacturer as to why his product doesn't fit correctly. I am sure he will tell you that it is the first time he has heard of this problem. Then switch to a chain. Clutch hub studs grooved - solution: replace the studs or the clutch hub assembly. This manifests itself in a dragging clutch due to the fiber discs (which have the small holes that the studs go through) being hindered from moving due to the grooves. If you choose to repair this by replacing studs, you can convert it to a 5 stud at the same time. The only advantage to a 5 stud is that allows a finer adjustment for the springs. 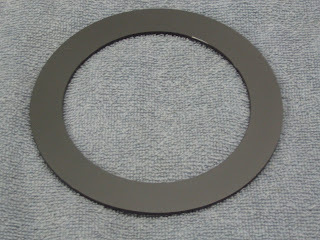 Clutch basket dogs grooved - solution: replace dogs or basket.This is similar to #5 above, except that it is the steel plates that have worn grooves into the dog s on the basket. This is far less common than grooved studs. Clutch pressure plate warped -solution: replace. 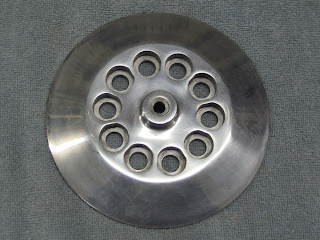 If the pressure plate is not flat, it will be very difficult to adjust the clutch so that the plate releases evenly. The best solution to this is to upgrade to an aftermarket aluminum pressure plate, often referred to as a precision pressure plate. Clutch springs out of adjustment - solution: adjust. This can show up in a couple of ways. 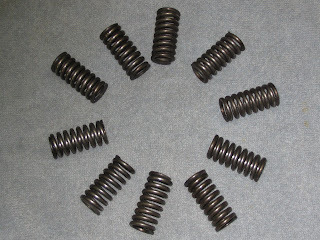 Springs that are not adjusted with enough tension can slip. Springs that are adjusted too tightly may coilbind before there has been enough movement of the pressure plate to allow full disengagement. The most prevalent problem, though, is not adjusting the springs for even pressure. This can cause the cause the clutch to be grabby or to drag. 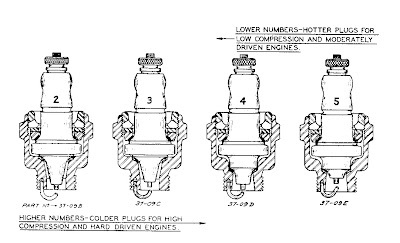 Your service manual tells you to adjust the three nuts on the clutch hub studs so that there is 1 inch between the stock pressure plate and the inside of the spring retainer. That is a good starting point, but for best results you need to pull in the clutch while watching the pressure plate and adjust those nuts so that the pressure plate comes out evenly. In other words, if one side of the plate starts to move before the other, adjust the nut on that side in a half turn or two until the pressure plate comes out evenly. Turn the pressure plate to different points in its rotation and double check this release. This is a major cause of a grabby clutch, and is easy to remedy! Clutch pushrod and adjusting screw not having "squared off" ends - solution: machine them or replace them. This fits hand in hand with #8 above. Somewhere along the line, someone came up with the bright idea of making a clutch adjusting screw (the screw that goes into the center of the pressure plate) with a ball bearing in the end. Obviously they thought this would be a plus if you did not adjust the clutch with enough free play. The problem is that it aggravates the problem of the pressure plate not releasing evenly as described above. Picture the difference between balancing a 5 gallon pail on top of another 5 gallon pail (with lid). Now picture balancing the 5 gallon pail on a basketball. Any small difference in spring pressure from one side of the pressure plate to the other will be magnified by "balancing it on an adjusting screw with a ball on the end of it. Usually the pushrod itself will have an end that is already "squared off." Insufficient travel of pressure plate for full disengagement. solution: restore full travel. This can be as simple as adjusting the clutch free play. Obviously if your clutch lever moves an excess amount before it starts to move the pressure plate, it may hit its full travel before the pressure plate has moved far enough to fully disengage the clutch. It is best to unhook the clutch cable, and then adjust the screw in the center of the pressure plate. In most cases this can be accomplished by turning the screw in until it lightly bottoms, and then back off a quarter turn. Then go back, hook the cable up, and adjust the free play at the lever. You must leave some free play or the throw out bearing will burn up. This is all it should take if all else is in good stock working order. There are a couple of other possible issues though. One is if you have a set of the really thick aftermarket grips that are on the market today. Your clutch lever will bottom out on this grip before it traveled as far as it would with the stock grip. (when I drag raced, I wouldn't run any grip at all on the clutch side just to add a little more travel) Another potential problem is in some of the clutch cables I have seen. In an effort to make clutch cables more "flexible" some of them have been "woven" with wires that are not stiff enough. I have seen cables that actually stretch somewhat as the lever is pulled, and then relax again when the lever is released. Sort of like using a big spring to release your clutch. Well, that pretty much covers the common causes and solutions for the 4 speed clutch problems, at least those that have come to mind. I may remember more later. In a future post I intend to cover some tricks and tips for high performance use. All in all, great performance can be realized without resorting to replacement of this durable clutch with one of a different design. How "Church" should be done is a subject that is at the forefront of more than just a few disagreements among Christians for the last .... well for the last 2000 years. In light of that fact, it should come as no surprise to us that it comes up often today. One question that has come to my attention recently pertains to who the worship service should be "aimed" towards. It may be that the "seeker sensitive" service that was all the rage for quite some time now, may be on its way out in "modern" churches. Some would argue that the seeker sensitive service missed the mark, because it was aimed at the wrong target. A church service should be for the Christian, not for the person who is trying to decide whether or not they should become one, they say. Frankly, I agree with that assessment, to a point. Anyone who has followed this blog for any time probably realizes that I am a conservative Baptist (and I hope that term has no connotations that I am unaware of). As such I don't have much time for the whole seeker sensitive thing. From what I have seen of it, the seeker sensitive church, to a large extent, has come down to luring in people (who are interested in spiritual things) by promising to be relevant and entertaining, and to enhance their life, but never really getting to the subject of sin and the answer to sin. Now a second way of looking at a church service has more merit, in that a church is an assembly, and a Church (note the capital C) is an assembly of believers (and being a Baptist, I would add baptized believers). John 4:23 says "But the hour cometh, and now is, when the true worshippers shall worship the Father in spirit and in truth: for the Father seeketh such to worship him." Hence a church service, or worship service would rightly focus on those who are already Christians. So far, this second type of service is a pretty good description of ValleyView Baptist over the past year and a half that my wife and I have been members. Nearly all of the sermons from our pastor (who has recently moved on to another church) were basically aimed toward edifying the body of Christ. While the subject of sin and the gospel were certainly not avoided, neither were they stressed because after all, those receiving the sermons were professed Christians. This is NOT meant in any way to reflect adversely on him; the fact is we miss and love him dearly. I have to agree that there is no point to inviting someone to your church if the gospel is not going to be preached. And just as important, if sin is never going to be mentioned, there is no point in preaching the gospel, since the man with a terminal illness who doesn't know it, will have little use for a life saving medicine. Wasn't that a major problem with the seeker sensitive service? So, by all means, if you are not going to preach about sin and the gospel, don't invite unbelievers to your church. But I do believe that may come with its own issues. I have heard (from more than one source) that young people attending Christian colleges, in many cases, cannot even articulate the basic tenants of the faith. Do you think there is a chance that many of these never really were born again? After all, if they grew up in the typical seeker sensitive church, they may have never been told of their desperate need of a saviour. But does this not also apply to the child who grew up in a church where "church" was done just for Christians? Let me tell you a little story that helps explain how I come down on this issue. Nearly 10 years ago, my wife and I attended a church service due directly to an invitation in the form of literature brought to our door. No, not Jehovah's Witness or Mormon; some Baptist's go door to door also. This was a fairly small church. Small enough that new faces were noticed by everyone, not least by the pastor. In retrospect, I have no doubt that the pastor of that little Baptist Church modified his sermon "on the fly" in order to present the gospel to these strangers. I would bet that he did the same the following Sunday. By the third consecutive Sunday, he probably expected us and prepared accordingly. If you haven't already guessed, that chain of events is how our most merciful God chose to save me. Maybe that prejudiced me, but I certainly would never feel shorted by a pastor who felt the need to preach a little hell fire and damnation topped off with the good news in place of an edifying sermon. In fact, I believe that a little more preaching of the law (which identifies sin) and the gospel would be a God honoring addition to any way that you might chose to "do church." One last point. If you, as a pastor, seldom preach the law and the gospel, just where do you expect your flock to learn to evangelize? Or do you plan on doing it all yourself? One of my daily stops on the Internet is a blog called The Recliner Commentaries. Dennis, the blogs author, does a great job of compiling current news items and adding his Christian perspective in the form of commentary. One of today's entries was a post called The Evangelical vote The whole article is well worth reading, but the gist of it was a list of many of the issues that are by and large supported by Democrats, but would not/should not be supported by a Christian. Dennis ends with the statement that he is "at a loss to understand how Evangelical Christians can vote Democrat with a clear conscience." This is my answer to that statement. I think the explanation of how Evangelical Christians can vote Democrat is obvious. The term "Evangelical" itself has gone the same way as the term "Christian". Early on in New Testament times, the term Christian meant only one thing. A born again follower of Jesus Christ. Today I think we would be extremely generous in estimating that 20% of those calling themselves Christian would match that first century definition. Even so, the term "Evangelical Christian." Unless I am mistaken, the term Evangelical came into popular use during the last century to differentiate those who were serious Christians from those who were not. Calling yourself a Christian had lost its meaning from overuse by those who were only nominally Christian, or in my view not really Christians at all. In fact, I would submit that those who claim to be Christians, but have never been born again, are guilty of breaking the command in Exodus 20:7 "Thou shalt not take the name of the LORD thy God in vain; for the LORD will not hold him guiltless that taketh his name in vain." I hold to the view that the purest meaning of this command has to do with calling yourself a Christian , and yet the taking of that name to yourself having no effect. This is nothing new. Even as Paul explains in the book of Romans, not all of national Israel were God's elect. Romans 9:6 says in part "....For they are not all Israel, which are of Israel:" I don't believe we are misusing the words by applying it thus: For they are not all Christians, which are of Christianity, or they are not all Evangelicals, which are of Evangelicalism. So if the question is how to understand how Evangelical Christians can vote Democrat with a clear conscience, my answer is that "they are not all Israel, which are of Israel." The high price of gas has brought with is one silver lining this summer. It has gotten me out of my pickup and back onto the Knucklehead. To my shame, over the past several years, I had just gotten out of the habit of riding to work. Seemed as though there was always some reason not to ride, whether it was wet weather, too much "stuff" that needed to go with, or something. But, this year was different. Spurred on by high gas prices, I doubt there have been a dozen days this summer that I did not ride to work. And most days I had a passenger with me. You see about 2 years back my wife Jane worked out a deal with our daughter Megan. Since Jane had a hankering for a puppy, and Megan's kids (our grandchildren) did too, they decided we should get one and have "joint custody". It seemed reasonable. Their house was only a few blocks away, and since Megan was home during the daytime, the dog would stay with them during the week, and with Jane and I weekends. That went pretty well for a while; until Megan and her husband bought a brand new house about 20 miles away. Really, who wants a dog messing up a brand new house? So the "joint custody" morphed into Grandma and Gramps having a full time dog (who goes by the name "Lady"). And since my wife works in an office, guess who brings Lady to work with him every day. Enter a cheap sidecar from a swapmeet. I never cared much for sidecars, but I did like to at least have the option of riding to work. 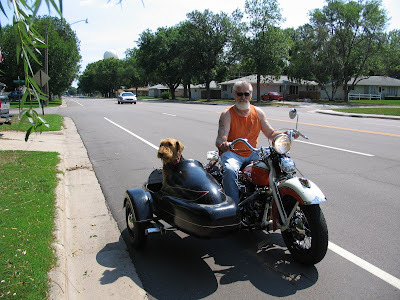 And besides, who can resist a dog in a sidecar. Incidentally, if you are considering a sidecar, I highly recommend one of these light weight aftermarket units rather than the overweight H.D. hacks. The OEM sidecars (in my experience) "pull" one direction when accelerating and the other when braking, not to mention hurting acceleration considerably. This 1973 vintage sidecar, weighing in at only 175 pounds does none of these things. I absolutely love good preaching! Good, strong, authoritative preaching. And of course to be authoritative, that preaching can be only be of one type; Biblical. If the preaching is not from the Bible, then in my opinion it lacks any authority. Matthew 7:28,29 "And it came to pass, when Jesus had ended these sayings, the people were astonished at his doctrine: For he taught them as one having authority, and not as the scribes." Note a couple thing here. Teaching is a part and parcel of preaching, unless we have mislabeled the "Sermon" on the Mount. Jesus taught as one having authority. That is because of who he is. The book of John says that Jesus is the Word. And the Word is God! Jesus preached and taught with authority because he is God. But how can a mere man preach with authority? It's easy if you preach the Bible. The authority comes from the Word of God, not from the eloquence or style of the preacher (if it was the latter I, for one, would never dare set foot behind a pulpit). Also note that preaching and teaching involves doctrine. That word doctrine isn't one that should scare you away. It simply means a principle or the body of principles in a branch of knowledge or system of belief . That definition comes from Websters. In the case of true Christianity, that would be a principle in a branch of knowledge. The knowledge of the one true God, Yahweh. In the case of all other religions, doctrine would be merely a principle in a system of belief. If you go back to the very beginning of the sermon on the mount (Matthew 5:1) , you will find that Jesus sat down to teach/preach this message. So why is it customary for a preacher of our day to stand behind a pulpit to teach? If you go to Luke chapter 4, I believe I can give you an answer. It has been said that it was customary in the Jewish culture of that day that a teacher would sit down to teach. This would seem to be verified by the account of the Sermon on the Mount, as well as here in Luke 4. Beginning in Luke 4:16-17 we see that the Bible says: "And he came to Nazareth, where he had been brought up: and, as his custom was, he went into the synagogue on the sabbath day, and stood up for to read. And there was delivered unto him the book of the prophet Esaias. And when he had opened the book, he found the place where it was written, .... "
After reading the passage from Isaiah, we find this in verses 20 and 21: "And he closed the book, and he gave it again to the minister, and sat down. And the eyes of all them that were in the synagogue were fastened on him. And he began to say unto them, This day is this scripture fulfilled in your ears." Jesus stood up to read from the scriptures. Then he sat down and taught with authority. Now if Jesus stood up to read God's word, would it not be reasonable to emulate him? And since any authority in our preaching/teaching comes directly from God's word, perhaps it is best that we remain standing to remind us to to keep the focus of our preaching on the Bible. Yes, I do love good preaching. Strong and authoritative. But you know what? The meekest and mildest of preachers can preach in a strong, authoritative way even with a meek and mild delivery. The strength and authority comes from the Word not the preacher! Another from my great grandfather, L.J. Schlattman's book of poems "Gleanings from Life". To waters so still He doth lead. For His name's sake He keeps me from evil and harm. No harm can befall me with Thee. I am safe in His keeping, with Him I'll abide. Exotic carburation! I have to plead guilty to having always been a sucker for it. 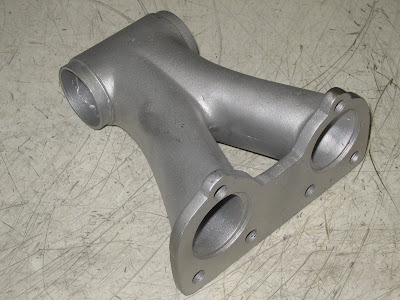 It may have begun when, as a teenager, I bought an Offenhauser 4 barrel manifold for my Studebaker from a local junkyard for $7. 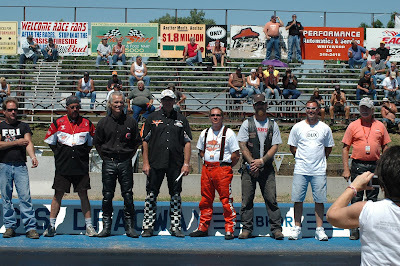 Things didn't change much when I moved on to Harleys. 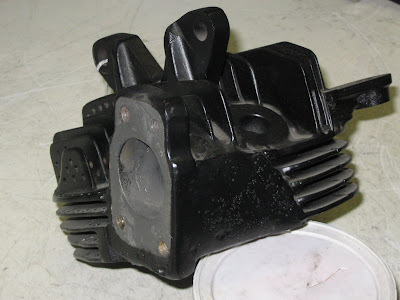 I vividly remember how cool those SU carbs looked on Pans and Shovels with the forward swept elbow. 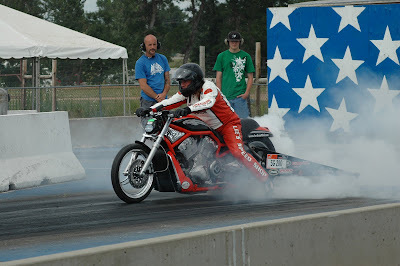 Of course later when I got into drag racing Knuckleheads, dual carbs became more a necessity than a luxury. But when it came to a street bike, the traditional modification of the heads to hold two carbs held a drawback; that being in the form of a big lack of leg clearance. Despite this leg clearance issue, the first dual Linkert setup I built consisted of one carb on each side. I used a pair of Linkerts (one on each side of engine going into a common manifold). I ran an M35 (1-1/8" venturi) as the primary carb, with an M74 (1-5/16" venturi) on the other side. I made up progressive linkage so that the M74 didn't start to open until the M35 was at half throttle, but they both reached WOT at the same time. It worked extremely well. Better gas mileage from doing most of your running on the small carb, but when you accelerated you could feel the second carb come in just like the secondaries on a car with a 4 barrel. The only downside was that the carbs I used had some wear so that too much air leaked past the throttle plates causing it to want to idle too high. I solved that by putting an auto advance distributor on it (the idle would slow when the weights came back retarding the spark). I think I could have solved the idle by using better carbs, or maybe by disabling the idle circuit on the second carb, but never tried it. Of course with the length of the Linkert, there still were leg clearance issues on the left side carb. Perhaps a better solution is the method I used on my second foray into dual Linkerts. This manifold is based on a vintage "aftermarket" dual Linkert manifold that I have (and have seen other examples of). 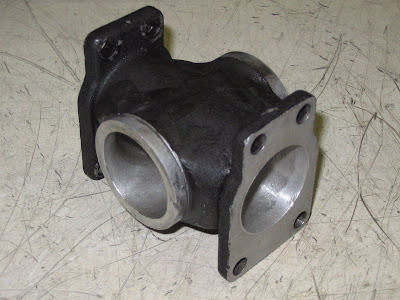 This vintage manifold is cast aluminum, and was designed to fit as a plumber manifold. My guess is that the aluminum would not have held up very well with brass seals and plumber nuts, but that is beside the point. 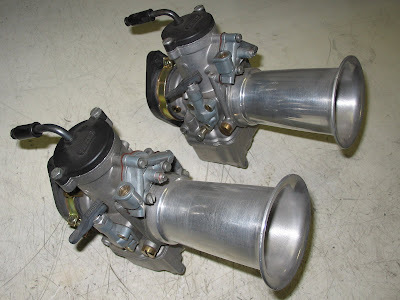 The manifold is set up to take a pair of 3 bolt Linkerts, and has individual intake tracts; in other words the front carb feeds the front cylinder and the rear carb the rear cylinder. This coupled with the space limitations for such a design mean that the runners are extremely small, and thus extremely restrictive. The longer "tuned length probably would have given great throttle response and very low RPM performance, but I would bet that a stock 4 bolt Linkert would give better overall performance. Still, this vintage manifold is cool looking, and more importantly served as the inspiration for the next dual Linkert manifold project that I undertook. This next one was at the request of my friend Elmer. Elmer is world famous (seriously) for his Harley restorations, however, some time back he began to get a little weary of building the same bikes over and over. His solution was to start building a few "period correct" bobbers. Dual Linkerts were just the ticket! So I built another "prototype", and not just for looks either. I did flow bench testing to confirm that the manifold would be beneficial in the performance department, as well as the aesthetics side. I built it to use plumber fittings, at Elmer' insistence, so that it would be period correct for the original Holister event. It worked out very well, though the one thing I would change would be to cad plate the finished product rather than parkerize it as I did. This was all quite some time ago now (as evidenced by my old Superflow 110 in the picture - I upgraded to the SF600 about 7 years back) I have just now finally started on an aluminum version of this manifold set up for O-rings. Is the world ready for such a manifold, or am I the only sick one out here? I guess that remains to be seen! It is not often that I find a point of disagreement with something from my Pastor's sermons. This morning, however, I did find one area that we did not see eye to eye on. We did get a chance to discuss it after the service in a mutually edifying manner. In preaching on "The Grace of our Lord" from 1 Timothy 1: 12-16, Pastor Voigt confirmed Paul's view of himself being the chief of sinners. He backed that up by referring to passages in Acts showing how Paul (when still known as Saul) persecuted the saints and tried to stop the growth of the Church and spreading of the Gospel. My disagreement with this making Paul the chief of sinners stems from the fact that the Bible says that Paul did these things in ignorance and unbelief (1 Timothy 1:13 "Who was before a blasphemer, and a persecutor, and injurious: but I obtained mercy, because I did it ignorantly in unbelief.") In fact Saul, being a Pharisee, thought he was serving God. He would have believed himself righteous by way of keeping the law of Moses. Now lets look at my life before salvation. I knew enough of the law, and even enough of the Gospel, to know that I was a wicked sinner. And I willfully continued in open rebellion against God for years upon years. In my book, that means that I far surpassed Paul as the worst of sinners. How do you see yourself? The Church where my wife and I are members is facing somewhat of a crisis. Our pastor, who has been there for over eight years has answered a call from another church. We will miss him and his family, both personally and as a congregation. While we wish Pastor Voigt and his family all the best in his new ministry, it does leave our congregation in a precarious position. We are a very small church, and have struggled financially for some time. I have heard voiced the expectation that some families will use this as an excuse to leave. It is also questionable that we will be able to attract another pastor. To add to the uncertainty, there is also a rumor that one of the Twin Cities' mega churches has plans to expand to our town. 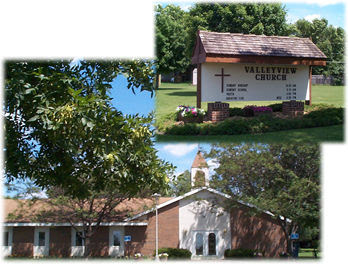 My hope is that any of you who follow this blog will pray for Valley View Baptist Church.